It’s the coolest thing on the street. Whether on one or two-wheeled devices powered by rechargeable batteries, people who use personal transporters definitely draw attention. And clearly they’ve changed the landscape of urban streets, especially Seoul. Twenty-something guys in chino pants and graphic T-shirts effortlessly glide through the forest of concrete buildings, while people on foot wipe off their sweat and try to walk as fast as they can to get to their destinations on time. They look like people from the future. From self-balancing unicycles to electric scooters, motorized mini-vehicles sure have evolved. Some have LED headlights built in for night driving, Bluetooth speakers to entertain, and software that interacts with smartphones to track distance traveled. 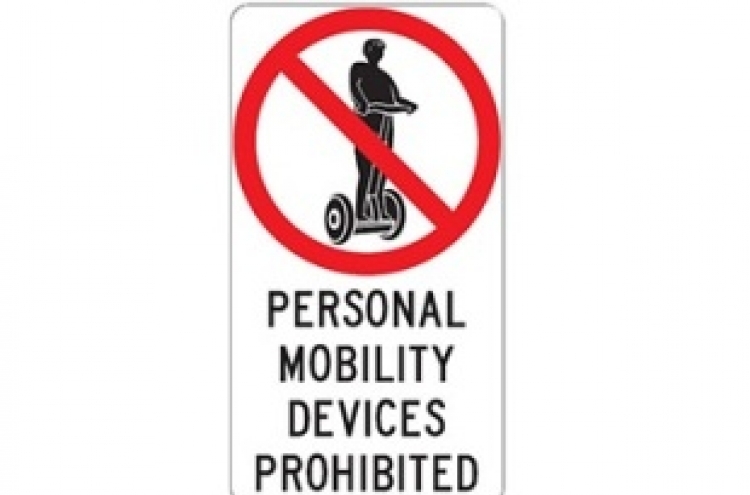 There are also hoverboards and skateboards with electric motors attached -- all you have to do is stand and balance. Currently, South Korea does not have any manufacturing facilities for electric mobility devices, but demand is high here, probably the highest level in the world, according to local experts. “South Korea is a unique country. The market growth of personal mobility is probably the fastest in the world,” said Yang Hae-rong, CEO of Eco I, an importer and distributor of personal mobility transporters here, without giving an actual figure. Companies that design and manufacture personal transporters are mostly based in China, although they use batteries made in Korea, from Samsung SDI and LG Chem. Even Segway, a US firm that led the market for personal mobility devices in early years, was acquired by the Chinese company Ninebot recently. Other big-name companies, such as Xiaomi, Inokim, King Song and iMAX, are also from China. The average price of a device is around 600,000-1 million won, considerably lower than in past years due to mass production and competition in the market, Yang said. But demand for luxury devices is growing. “There are products priced between 1.5 million and 3 million won. Most of the pricey devices have two motors that allow them to go faster. Some can go at 70 (kilometers per hour). But it’s dangerous,” he said. Personal mobility devices are designed to fulfil the “last-mile” distance for commuters. But riding a PMD is becoming more of an all-day activity for Koreans. Some people buy PMDs for occupational use. For food delivery drivers and couriers, motorized mini-vehicles have opened a new chapter, a market observer said. Curiosity about the new devices has led market growth, but the stagnant economy and rising oil prices have played a part too. “People don’t want to spend money on expensive transportation in the bad economy and they don’t want to pay for gas,” Yang added. With the bright prospects for the market, big Korean companies are eyeing the opportunity. Hyundai Motor introduced the foldable electronic scooter Ioniq at the 2017 Consumer Electronics Show in Las Vegas. Internet portal giant Naver also unveiled a four-wheeled skateboard as part of its personal last-mile mobility project earlier this year. It balances through a tilting deck mechanism, according to the company. Both models are there to illustrate design concepts, and are not for sale.